How Do You Balance Your Health And Your Checkbook? I am a hypochondriac. I blame WebMD, mostly, specifically their Symptom Checker tool, which will read symptoms like "headache" and "back pain" and often suggest everything from "common cold" to "you are totally dying of the Bubonic Plague, sorry, dude." Perhaps it's not that extreme, but at times it certainly feels that way. 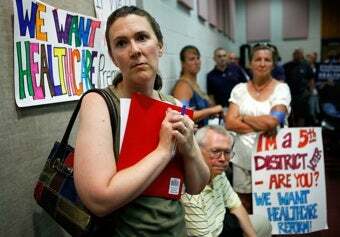 And as it is often discussed in the debate over universal health care, for many Americans the choice between going to the doctor and paying the rent often ends up with many people eschewing checkups in favor of being able to spend their money on other "more necessary" bills; food, shelter, etc. Our bodies become the lowest priority, often enough, when we're faced with a choice between a doctor's office visit and a rent check; we know for certain that the rent needs to be paid, but we're never sure if the doctor will find anything, and the risk of going through very expensive testing for an inconclusive result just doesn't seem worth it. However, there's always that nagging feeling that there might just be something very wrong with us, medically, that should be looked at. So what are the uninsured/partially insured to do? As Jill Hudgins writes in the Los Angeles Times, "I can't afford to get sick." Hudgins details her difficulties with insurance company payments—even when she was covered, the insurance company only picked up $400 worth of her medical bills after she was rushed to the hospital with a racing heart—to the tune of $5000. "I haggled with insurance representatives for weeks, asking why I should pay nearly $300 per month for a plan with as much coverage as a Brazilian bikini," Hudgins writes, 'One of them said, "It gives you the security of having insurance.'" Hudgins now says her new plan is to, well, not get sick. Easy to say, of course, but hard to stick to, especially as flu season starts sweeping through town. I am in a somewhat similar situation to Hudgins: I'm insured, but my insurance (like most) is fairly shady in terms of what it will and will not cover. It forces me, like many others, to prioritize and make the difficult decisions between what is a must, healthwise, and what can wait. And as the debate over universal healthcare continues, it looks like many of us will continue to make such choices. So how do you deal with such situations? Do you find yourself leaning toward home remedies? Heading to work sick? Letting go of other things in order to focus more on your well-being? For me, at least, one thing is for certain: I have got to stop checking my symptoms online. It's really not good for my SmurfPsychoLungHeadacheSnorkoliosis.